Some compadres and I are thinking about hiking into Sunset Lake by way of the Barclay Lake trailhead. Anyone ever done it before? If so we could use any info ya got. Looks like making it to Eagle lake will be pretty easy, it's from there to Sunset that we need to plan. It appears there is a ridge at the Merchant end of the lake that drops into a valley. It also looks like that valley could be followed down to where a creekbed goes up to Sunset. We are going to leave around 6 AM and are goinf to try to make Sunset lake by 3pm to set up camp. control your destiny, or someone else will! From your post it's painfully obvious you have never been to Eagle lake. I have yet to hear any one comment on the route from Barclay to Eagle as "easy". Since you have no trip reports yet...i cannot even begin to gauge your experience level. Perhaps your an extremely competent mountaineer and are looking for an extra challenge by going in from Barclay lake. I don't know how many USGS quads your looking at, or how old they are. There is a road a hair less that two miles away from Eagle lake and 200 feet in elevation lower. From this road it is about a 40 minute walk to Eagle lake. There's a hand trail on along the south side of Eagle creek. Now the Saddle between Townsend and Mechant sounds like a good idea. If you stay high. Dropping down into the creek drainage is a huge mistake. 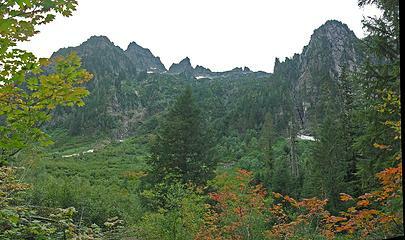 I have been on the opposite side of that saddle in Trout Creek drainage and dense Slide Alder and Devils club. If your insist on taking the Trout Creek drainage, it will be much easier to go in from Index-galena road. But this is brush too....however it's less elevation gain and distance than going in from Barclay. No I have not reached Sunset lake yet...there are some lessons i have already learned trying. You are correct about me not going to eagle lake. I have done most of my packing at around 8 to 10k in the Rockies outside Ft. Collins and near Manastash and umptanum ridges here in washington. I have been to Barclay, and that was certainly just a simple walk as opposed to a hike. Stone lake is less than a mile from Barclay so (set aside a bit of steep ground) it seems that it would be fairly "easy". I am curious about the saddle and trout creek drainage info though. We are wanting to take on the challenge of going in from the Barclay side as it seems a bit more difficult. I had also thought of following the ridge to Lake Simms and trying to skirt around to Sunset. One way or another we'll get there. In all Sunset is only about 3 miles from Barclay so if we have to do some "bushwackin" were ok with that. Apparently I have it stuck in my head that i need to get to sunset lake.....no one else seems to have a story about making it there. Thanks for the info, keep it coming !! Yo MM, welcome to the site. I know people that have gone into Sunset lake. 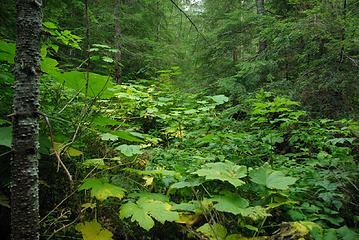 They ALL have accessed the lake via Trout Creek and the logging road associated with it. Its a bit of a brush bash, but a nice lake. Ill send you a pic of the lake via PM. Just gotta chime in here and say I've been to Sunset and from there went to Simms. Getting to Sunset involved a lot of brush. Getting from Sunset to Simms involved a lot of traversing steep, slippery duff-covered hillsides, followed by brush. Been to Sunset several times. Gone in a few different ways, Via FlapJack, Trout Creek and 4th of July creek. Each way has the plus's and minus's. Sumpin tells me there you have not encountered brush like that in Trout Creek Valley. For that matter, the brush on the wet side is a force to be reckoned with. Here's a little taste of what you in for. Here is the back side of that Saddle between Townsend and Merchant, from Trout Creek valley. Note, i had to shimmy up a tree to a large boulder and use my tripod as an extension of my arm to get that shot above the brush. When you went into Simms and Sunset, did you come by way of Eagle Lake, or up Trout Creek? My intentions were to hike up and over the saddle on the far side of Eagle Lake opposite Paradise Meadows (coming from Stone/Barclay), then follow the contour just below ridge line north then east to get to Simms/Sunset..... Everyone on the blog seems to have encountered nearly impassable conditions around simms and sunset lakes. I don't know if that is because they pack without a good map and satelite photos of the area, or simply don't like bushwackin through the woods here and there. I have looked at satellite imagery in combination with topo and contour maps, and it seems that with a little planning we could Make Sunset from Barclay in about 5 or 6 hours and avoid a lot of the "Heavy Bush" folks are talking about. We are heading up on Sept. 24 and have an entire day to make Simms / Sunset ....lite packs. My expectation was to leave the Barclay Trailhead at around 7 am, and make Sunset by about 3 or 4 in the afternoon on Friday then pack out on Sunday morning.....sound doable? So i have yet to reach Sunset or Simms. I do think that saddle on the far side of Eagle is the correct route. But dropping into that valley in not. So, ive come up from Trout Creek Valley. The Brush slows things down, packing light as in day hike...i simply ran out of time. As for map...i have GPS..I think it is possible to get to Sunset via Trout Creek...it's just a bush bash suffer fest. Now Townsend is mostly open, sans that saddle which is forested. I've tried to head up Townsend for some recon.....but had to return..too hot of day its steep no water, easy to get heat stressed. If i did not chose such a hot day, i have no doubt i would have succeeded getting a good view point from Townsend. Realize this...none of us are trying to discourage you from making this trip. I just think your underestimating this trip. Either way...cant wait for this Trip report after you make it. Warnings well noted, thank you. I have packed through some pretty rough terrain before in the rockies, and in the Gifford Pinchot .... however, here on the west slope it gets pretty thick. I don't mind a little bushwackin. We are giving ourselves 8 hours to make Simms on Friday. Leaving at 7 AM Figure about an hour to Barclay (no rest there, its just a simple walk really), then around 1 mile to stone (little steeper/more rugged) figure another hour if we take out time. Then Eagle lake is a 15 minute stomp through the meadow. that leaves almost 6 hours to make Simms or Sunset. I am assuming we will hike straight through to Eagle with very few stops (were all in pretty good shape .....after a break at Eagle, up the ridge to the saddle and northeast to Simms. So, the question really is, Can we make Simms from Eagle in about 4+ hours? I would think that is plenty of time even with a little bush to tromp around in. Hulk, an 8 foot tall wall of devils club has to be encountered, not talked about, to fully understand. I too await the trip report. That's the best case scenario, which is rare. Usually, devils club tines pierce leather gloves and clothing, and a machete just bends them so that now they're eye-level. So not only are the tines on the stalk ripping the flesh off your face, the tines on the leaves are shredding your eyeballs and burrowing into your retinas. 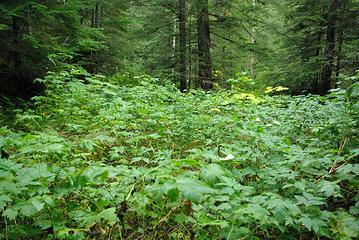 But overall, devil's club is a lovely plant.